There are several options when choosing a shower drain for your preformed shower base installation. Your choice depends on your shower pan and your situation. And the type of pipe you have in your home may help determine which shower drain material you should buy. 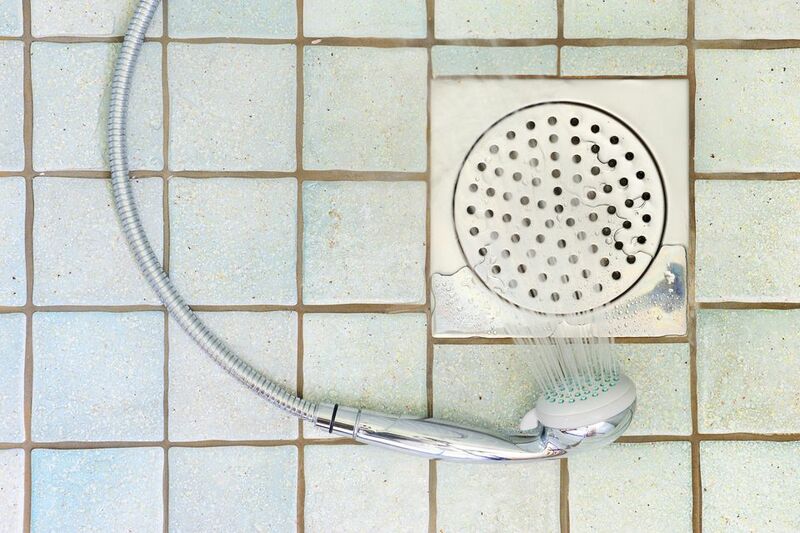 The manufacturer’s recommendations for both the shower pan and the drain may also help you determine which shower drain to buy. Now let's take a look at some typical shower drains and a quick explanation of how to install them. Compression type shower drains attach to the home drain pipes with compression washers and nuts. They are easier to install, generally than glue-on shower drain connections. Compression drains come in PVC, ABS, or brass pipe. Any of these can be used with steel, fiberglass, or plastic shower bases. When installing a compression shower drain, the drain fitting is first installed into the shower base. The drain pipe should come up to about 3/4" to 1" below the lip of the shower drain. You may have to put the shower base into place to mark the right height, then remove the pan to cut the pipe. Put either plumber’s putty or silicone caulk onto the top flange of the shower drain fitting, then insert the tailpiece of the drain fitting into the drain opening. Put the cardboard friction ring and large rubber washer onto the tailpiece from under the shower base. Tighten the shower drain until it is nice and tight, then remove any excess putty or silicone. Put the shower base into place and push the rubber gasket into the drain pipe. You may need to use a screwdriver to push this into place, as they are designed to fit tightly. Normally these shower drains come with a tool to help you tighten the nut from inside of the drain. Tighten the nut with this tool. Once the nut is tight, your drain is ready for water if you used plumber’s putty. If you use silicone, you will have to let the silicone dry before testing the drain for leaks. Glue-on shower drains come in ABS and PVC plastic. If you have a plastic drain pipe, make sure to match the shower drain to the type of plastic in the drain system. Like the compression-type shower drains, this type can be used with steel, fiberglass, and plastic shower bases. With glue-on fittings, it can be harder to get the pipe measurement right, so make sure to measure carefully and double-check the dry-fit the pieces before gluing. When cutting the drain pipe, don’t cut the pipe too short, to begin with. Put the bottom part of the drain onto the drain pipe without gluing, then set the shower base into place to check the drain pipe height. Make adjustments accordingly. Once the drain pipe height is right, you can either install the drain onto the shower base first or glue the bottom part onto the pipe and then tighten the top flange once the base is set into place. Use plumber’s putty or silicone on the top flange of the shower drain. The paper friction washer and the rubber washer go onto the drain tailpiece from underneath the base. Note: Use the appropriate glue when gluing the drain to the pipe: ABS glue for the black plastic and PVC glue for the white plastic. If you are installing a drain for a custom-made tile shower base, the drain fittings are positioned during early steps in constructing the ceramic tile pan. Tile shower drains come in ABS, PVC, and cast iron types. Shower drains for showers have a built-in flange that will bolt the waterproof membrane liner to the pan. This liner is the lowest layer of water resistance and will make sure anything getting in under mortar will still go down into the drain and not leak through the shower pan. Shower drains have three pieces: a bottom flange, a middle flange, and the strainer fitting. After the subfloor of the shower is prepared and clean, install the bottom flange of the shower drain into the drain pipe, usually by gluing. Use troweled mortar to create the solid underlayment for the shower, sloping it 1/4" per foot from the walls toward the drain. The liner is then installed over the floor and flange of the shower pan. Use silicone caulk to seal the liner to the drain flange. Trim away the liner around the drain opening. Insert the middle flange of the drain fitting over the liner and drain opening, using bolts to secure it to the bottom flange beneath the liner. Attach the drain strainer assembly to the drain, so it stands up from the liner about 1 1/2". Now you are ready for the rest of the ceramic tile installation. Normally this will involve a second layer of mortar, then the ceramic tile applied over the mortar.